Daniel Pawson had a career that would make many people jealous: He previously worked as a chef at three Michelin-starred restaurants, including The Waterside Inn, and later became a private chef to celebrities like Kylie Minogue after winning several cookery competitions across the U.K. and overseas. But none of these achievements has made Pawson sit on his laurels or stopped him from further pursuing his passion for high-quality food. One thing that stood out for him was a tremendous amount of food waste that he saw over the course of his career. “As chefs, we saw a huge amount of fish skins being wasted in restaurants and we decided to crisp them up and serve them as garnishes. Customers loved them,” he said. That was how the idea of using recycled salmon skin to make consumer-friendly snacks was conceived about two years ago. Pawson and his business partner Dominic Smith (they had together operated a mobile food trailer selling potato rostis at events and festivals in the past) decided to ask fishmongers in the U.K. for salmon skin as it has the perfect thickness and comes out high in nutrients after being cooked: 63 grams of protein per 100 grams and full of Omega-3. “Fishmongers usually throw them away, but after looking into the amount of seafood waste [half of which is thrown away in the U.K.], we felt we had to put an emphasis on addressing this issue,” Pawson told me in an email interview. There is also a huge demand for ethical and sustainable snacks with health benefits in the consumer packaged goods (CPG) category, so the timing of launching Sea Chips was perfect, he said, adding the company sources skin from MSC-certified farms where salmon are fed without artificial ingredients in their feed. Sea Chips currently comes in three flavors: lightly salted, salt and vinegar, and lime and chili. All of them are available in mid- to high-end retailers, such as Whole Foods, Fenwicks and Harrods stores across the U.K., as well as via Amazon. Even though salmon skin-made chips have created a buzz in the U.K., Sea Chips is not the only snack brand that recycles discarded food from processors. Ryan Farr founded snacking pork rinds brand, 4505 Chicharrones, nine years ago in San Francisco by using wasted pig skin from local butchers. Meat-producing giant Tyson Foods also created its protein crisps brand, ¡Yappah!, made with discarded carrots, celery and its own upcycled chicken breast trim earlier this year. Similar with many entrepreneurs in the CPG world, Pawson found a hard time seeking initial funding, noting that, although many Asian-inspired snacks, such as seaweed chips, had been growing in popularity in the U.K. for many years, crisps made of fish skin was nearly unheard of. He and his team decided to make Sea Chips more accessible by comparing them to pork scratchings, a popular British snack, and donate 10% of their profits to ocean charities, bringing in customers who want to make a difference with their dollars. Sea Chips’ social media sensation quickly caught the attention of Jonathan Brown, the mastermind behind Macknight Smoked Foods, while he was running the business in Florida at the time. Brown, who is now a shareholder of Sea Chips, owns 10% of the salmon market in the U.S., and has over 30 years of salmon processing experience, according to Pawson. He was reportedly using two advisory firms, one in France and the other in the U.S., to sell his company in May 2018. 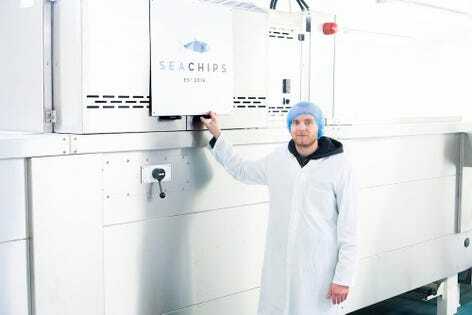 Sea Chips received its first investment from Brown about 10 months ago and has since secured a state-of-the-art production facility in Cumbria, U.K., as well as multiple buyer connections. The 10,000-square-foot Cumbria plant, which is able to produce 100,000 units a week, is uniquely designed for making salmon skin chips: Its highly technical oven is able to recreate frying without the oil, and its band saws can cut crisp-size pieces. With the current production capacity, Sea Chips is positive that its first £1 million ($1.27 million) revenue goal can be achieved within 18 months, and is not ruling out potential acquisition opportunities. “We’re in talks with some major supermarkets in the U.K., and plan to be in three nationwide retailers by the end of 2019, which can be worth anything from £250,000 ($319,000) to £750,000 ($956,000) each,” Pawson noted, adding that potential retailers include Sainsbury, Ocado, and Waitrose. In the longer term, Pawson and Smith also want to expand their business into jerky towards the end of 2019, as the category is poised for high growth. According to Grand View Research, the European meat snacks market is expected to reach $4.59 billion by 2025, driven by the rising demand for healthier protein snacks and growing awareness regarding lifestyles. The market research firm noted the introduction of Jack Link’s has transformed the market landscape in this region, and the launch of different product forms, such as handmade sausage crisps, is expected to have a positive impact on market demand. In order to become a fully sustainable food company, Sea Chips also looks to convert its packaging to a biodegradable version in early 2019, although biodegradable packaging is still relatively new within the chips market. “We are running our own tests to make sure it has the correct shelf life and will work with our packaging machinery [once the tests are completed],” Pawson said.